I read this article and found it very interesting, thought it might be something for you. The article is called Varanasi, Allahabad Air Breached WHO Pollution Limits Almost Every Day In August and is located at https://archive.indiaspend.com/cover-story/varanasi-allahabad-air-breached-who-pollution-limits-almost-every-day-in-august-44511. 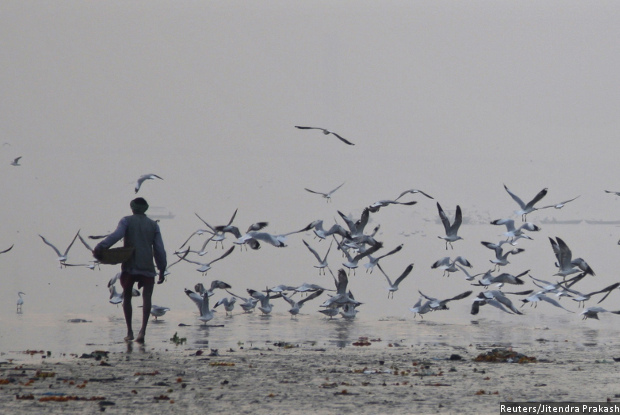 A vendor carrying a basket of flowers walks as migratory birds fly over the banks of Sangam, the confluence of the three holy rivers Ganga, Yamuna and Saraswati, in Allahabad, Uttar Pradesh. Air pollution in Allahabad and Varanasi exceeded the World Health Organization acceptable limit 93% and 96% of the time, respectively, this August. The most likely reason for this could be vehicular pollution. Both Varanasi and Allahabad were badly hit by flooding in August, 2016, leading to traffic congestion. On more than 90% of the days in August this year, pollution levels in Varanasi and Allahabad exceeded World Health Organization (WHO) guidelines for acceptable levels, an IndiaSpend analysis of data recorded by #Breathe, out 12-city network of air-quality monitoring stations, shows. This can be a lethal situation because a day with a high concentration of airborne particulate matter (PM) can lead to short-term mortality, according to a WHO report. This is when an ill person dies within 30 days of a visit to a hospital, or during the visit, according to a Journal of Epidemiology article in 2003. 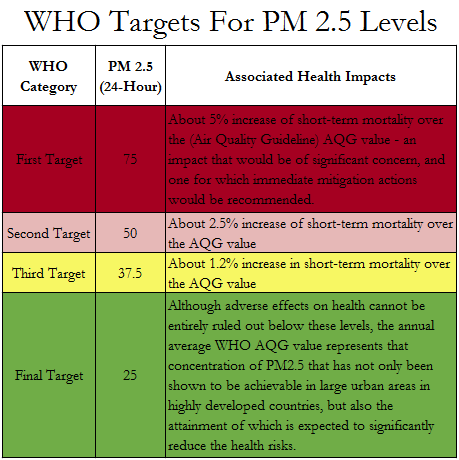 The WHO guideline for 24-hour average for PM 2.5 is 25 per cubic metre, and it reflects “the concentrations at which increased mortality responses… are expected based on current scientific findings”. PM 2.5 are particles measuring less than 2.5 µm (micrometre, one millionth of a metre), a fifth of the size of a fog or cloud water droplet. The main source of these is vehicles, boilers and power plants. People with breathing difficulties such as asthma, and lung and heart diseases are most at risk to PM 2.5. A WHO report suggested that a country regularly exceeding the 24-hour limit “undertake immediate action to achieve these levels in the shortest possible time”. And Varanasi exceeded the limit 96% of the time this August–27 out of the 28 days monitored. The most likely reason for this could be vehicular pollution. Both Varanasi and Allahabad were badly hit by flooding in August, 2016, leading to traffic congestion. On 26 days–93% of the days examined–Varanasi’s PM 2.5 levels averaged over 30 per m³. A reading between 30 and 60 is regarded as ‘satisfactory’ under the Indian government’s Air Quality Index (AQI) guidelines. This assessment suggests that only a sensitive few will feel its effects, and then too only breathing difficulties. But the WHO warns that a level of 37.5 is associated with approximately a 1.2% increase in short-term mortality. Of the days monitored in Varanasi, 64% (18 days) had an average level of over 40, and 54% (15 days) had an average PM 2.5 level of over 50–associated with an approximated 2.5% increase in short-term mortality, according to the WHO report. On 11 days out of the 28 examined (39%), the level in Varanasi was over 60, classified as ‘moderately polluted’ under the Indian government’s guidelines, and ‘may cause problems for people with asthma, heart problems, or children and the elderly’. In Allahabad, 28 days in August (90.3%) were over the WHO guideline, on an average. 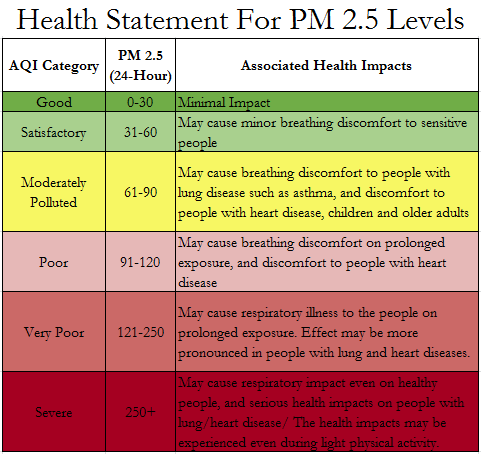 PM 2.5 levels were over 30 per m³ on 24 days–77% of the time. On four days of the month, the level was over 60. The above table shows WHO targets which “have been shown to be achievable with successive and sustained abatement measures. Countries may find these interim targets particularly helpful in gauging progress over time in the difficult process of steadily reducing population exposures to PM”. On August 25, 2016, when Varanasi was celebrating Krishna Janmashtami, the city suffered its worst 24-hour average of 118.6–274% higher than the WHO’s recommended limit. By WHO estimates, this would translate to about a 9.4% increase in short-term mortality. The day began with an average level of 151.8 between 1 am and 6 am–six times the WHO limit. The levels then dipped, but spiked again in the evening, ending at an average of 136.7. The Indian government classifies this as ‘very poor’ conditions, which, if endured too long, can lead to breathing problems, particularly for people with lung and heart ailments. In Allahabad, August 29, 2016, was the worst day, where the 24-hour average for PM 2.5 concentration stood at 93.4–associated with roughly a 6.8% increase in short-term mortality. In the early morning–12 am to 4 am–the average reading was 107.4. Fridays showed the lowest levels in Varanasi at an average reading of 43.4, while Wednesdays had the best conditions in Allahabad, averaging at 35.5. Thursdays, with an average PM 2.5 level of 64.6, were the worst in Varanasi’s August, while Tuesdays were the worst in Allahabad–the average PM 2.5 level was 47.1. The worst hours extended from 6 pm to midnight, with an average PM 2.5 concentration of 71.4 throughout Varanasi and 46 in Allahabad. Further, 9 pm was the worst single hour, on average, in Varanasi, with a PM 2.5 concentration of 81.6, and 2 am the most toxic in Allahabad at 57.9. In both cities, 3 pm was the safest hour of the day to be outdoors, the levels averaging at 32.6 for the month in Varanasi, and 32.1 in Allahabad. Varanasi and Allahabad enjoyed their best air quality between 2 pm and 4 pm, when the levels averaged 33.6 and 34.1, respectively. The same hour was best in Chennai, IndiaSpend reported in April 2016. But the lowest levels are still over WHO recommendations.